As part of UC Cooperative Extension's effort to spotlight volunteers, we are so happy to draw attention to another special volunteer, Ernest Miller, Master Food Preserver Program instructor, Master Gardener and executive chef at Farmer's Kitchen in Hollywood. The Master Food Preserver Program's tremendous success, since its resurrection in LA County last year, could have not been possible without Miller's talent and commitment to food safety and the local food preservation "movement." For the first class in spring 2011, after a 10-year absence, Cooperative Extension received applications from more than 70 residents, all competing for 18 spots. The first group of highly-qualified students were selected to be the core group to help revitalize the Master Food Preserver Program in Los Angeles. The first graduating class included Rachel Narins (Chicks with Knives), Karen Klemens (Mothercluck Jams and Preserves and Mother Moo Creamery) and Milli Macen-Moore (Milagro-Allegro Community Garden). Miller's path to the food world was a varied one. In 1992, he graduated with honors from the U.S. Naval Academy and served overseas as an officer in the Navy. While traveling around the world, during his decade-long military career, he discovered and explored diverse cuisines. Often, he attempted to cook what he encountered for family and friends at home. 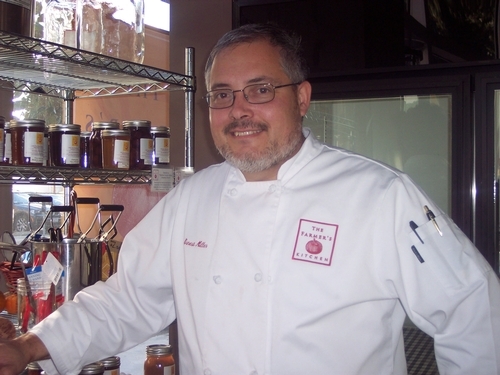 Although Miller is enthusiastic about food from all corners of the world, his affection lies in Southern California cuisine and food preservation. After Yale Law School and a brief legal career, he enrolled in culinary school to pursue his passion for food. While working as a line cook at the Disneyland Resort hotels, Miller heard about UC Cooperative Extension's Master Food Preserver Program. When he inquired, he discovered that the program was defunct for more than a decade. Determined to get certified, he made the dreadful commute to San Bernardino County to attend the only active Master Food Preserver Program in Southern California. In 2009, Miller received his certificate. Upon graduating, Miller began volunteering by teaching classes on the basics of food preservation for the Master Gardener Program. He played a key role in bringing back the Master Food Preserver Program in LA County. In addition, he volunteered countless hours attending farmers markets and sharing his knowledge. In 2010, Miller went onto receive his Master Gardener certificate, which marks the beginning of his seed-to-plate interest. Now, he seldom discusses food preservation without discussing how to grow food. Today, Miller is at the center of the food preservation community in Los Angeles. He continues to organize and teach for the Master Food Preserver Program as well as conduct food preservation demonstrations and talks around the county (including Eat Real Festival, Huntington Library, Workman-Temple Homestead Museum, Natural History Museum and the LA County Fair). "As people grow more of their own food and insist on locally-grown farmers market produce, they are becoming more and more interested in food preservation," said Miller. "The Master Food Preserver Program complements and extends the utility of the Master Gardener Program and Grow LA Victory Garden Initiative," he added. Many LA County residents are familiar with Miller. Since 2010, he has received recognition on KCRW's "Good Food" and has been blogged about on several occasions by the LA Times and LA Weekly. He has attained household-name status in the local sustainable food community. Thank goodness for activists like Ernie, without whom the MFP program would probably still be dead as a doornail. Just look at the number of applicants so far to see how much hunger there is for this program! Had the real pleasure of attending Mr. Miller's class on making Old Fashioned Ice Cream at the Homestead Museum. Not only did we get a nice booklet giving both the original version and updated version for vanilla, orange, and walnut ice cream, we made them in hand-crank machines. We were told not only the history of ice cream but also the history of Southern California agriculture. And, he considered those of us hard of hearing by front seating, making sure we could follow along. I am so inspired by Ernest's perseverance and commitment. It reminds me, once again, that great things rarely "just happen," but are made manifest through consistent effort and partnership. Kudos to Cooperative Extension for working to make this program a reality. Now...can I drive to San Berdo from Santa Barbara next spring...hmmmm... Thank you!! !